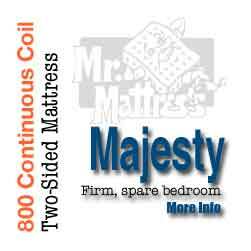 Majesty Mattress | Mr. Mattress is Vancouver's Mattress Store (Since 1964). This mattress is one of our most popular and has been a staple in our lineup for years. If your budget is on the lower side, this is where you’re getting substance for your dollar. The Majesty has 800 continuous coil, fibre pad, 1/2 ” layer of foam, plus 1″ foam quilted to the cover. Remember, this is the spec for each side of the Majesty mattress because it is padded on both sides.